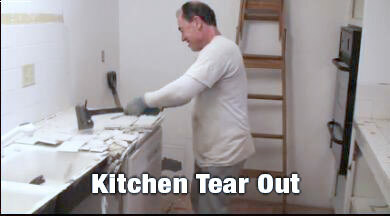 Some of my favorite jobs are the kitchen and bathroom tear-outs. the kitchens are my favorite of the two, particularly if there is ceramic floor tile to be removed. The cabinets come out quickly if you know what your doing and so does the tile on the floor. 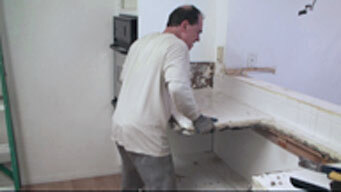 I’ve had kitchen and bath demolition jobs in the Hollywood Hills, the San Gabriel Vally and the San fernando Valley, as well as in Santa Clarita, Valencia and all over the West side, from Culver City and Santa Monica to west Hollywood. Recently I did a job for a realtor, working on her own property in Alhambra. I demolished a bathroom, tore out the carpet, wall panel, pulled up the kitchen and dining room linoleum and wood flooring, and removed the kitchen cabinetry from her two bedroom duplex. She was in a hurry to move in and I had the job done within the same week she approached me. I met her at the Glendale realtor’s association meeting, which I am a member of. I do a lot of work for realtors, removing things left at the properties they are selling, as well as working for them personally. On this job the first thing we did was break up all the kitchen cabinets and load it all into the truck. Next the linoleum flooring had to come up, the problem I didn’t foresee was that it had been glued to a thin wood sheeting which had been tacked over the original floor. It is not uncommon to have multiple flooring materials in homes over thirty years old. It took hours and a lot of work to chisel, pry and pull off the last two layers of flooring material. Next we pulled up the carpet and padding in the two bedrooms, closets and hall, and then cut it into pieces enabling me to pack it better in the truck. Then I pulled off the wood wall paneling in the living room. The bathroom tear-out was typical, first the sink had to be disconnected, the cabinet removed, then the medicine cabinet and toilet. Next I chipped away the tile on the walls around the bathtub, then the plaster and chicken wire holding it had to be broken through and pulled off the studs, that’s the hardest part. Then the tub had to be removed, in this case I broke it into pieces with a sledge hammer. It was cast iron and not easily broken. Finally I pulled up the vinyl flooring. Once that was all loaded, we took up the carpet in the living room along with the padding as before. the whole job took two days and I packed the entire contents of that two bedroom duplex in about half of my truck. I remember a job I did in Glendale, where I had a two apartment tear-out. The worst was a single that we pulled up the carpet and padding and vinyl flooring in the bathroom and remove the refrigerator. The other one was upstairs and a one bedroom, with the carpet in the bedroom, hall, closets and living room, along with the padding to go. I tore up the flooring in the bathroom and kitchen, as well as demolished the entire kitchen cabinets, took out the stove, and sink. I did the whole kitchen in about forty five minutes. 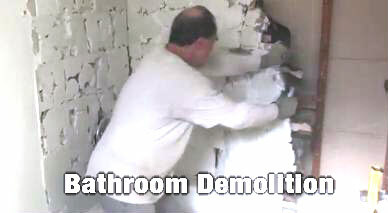 We did both apartments in about seven hours, that’s demo, removal and loaded. There was a house in San Gabriel where the kitchen was all metal. All the cabinets were metal ! there was a lot of other trash and garbage of all kinds around the house as well as in the garage. It was the usual stuff like furniture, appliances, clothing children’s toys and beds. it was not easy getting the metal cabinets off the walls without damaging the walls, but I did, it just took more time.